Black Keld, the rising for many of the potholes on the east side of lower Wharfedale (including Langcliffe Pot and Mossdale Caverns), is the biggest in the Dales. It first attracted the attention of Cave Diving Group members as early as 1949. Major advances were not made until fairly recently, for two main reasons. There has been a long history of restricted or no access here and the visibility is usually atrocious due to heavily peat stained water (the clue being in the name, Black Keld!). The diving starts from the resurgence pool and a branch line is soon passed off to the right which surfaces in Lake 1, an extensive airspace. Continuing along the main line leads to air in Lake 2 at 119 m from daylight. In low water conditions it is possible to follow dry (high level) passages between these two lakes. Sump 2 is entered from Lake 2 and is 60 m long, with some quite awkward underwater terrain, involving a difficult restriction. This surfaces in Lake 3, from where a bedding and a canal enter an impressive vadose section with knee deep water, heading generally eastwards. Some 200 m from the end of Sump 2 is a junction where a separate series of passages heads off to the right (southwards), involving further sumps and ending in various terminations either at boulder chokes or where it becomes too low. Back in the main route, some 237 m beyond the end of Sump 2, the short Sump 3 is met (easily free dived). Sump 4 soon follows, surfacing in another lake chamber which leads to the 640 m long Sump 5 after 10 m.
The initial part of Sump 4 weaves about where initial route-finding was far from straight forwards. Soon a south easterly trending section is gained and this direction is maintained all the way to where air is reached. A fine streamway section is entered, up to 20 m high and 3 m to 4 m wide, eventually ending at Sump 6. This is a 475 m dive, often in a spacious passage with occasional large airbells but also some deeper sections (maximum -21 m) and some areas of more difficult route finding due to sediment banks and complex passage forms. A large lake airbell follows, 35 m long and at least 7 m high. Sump 7 comes next, 60 m long to a short section of streamway followed by Sump 8, soon surfacing in a 10 m high streamway. Several small cascades lead, via a larger 4 m waterfall, eventually to Sump 9 after a total of 350 m of fine passage. This gives a shallow 50 m long dive. More streamway follows, including a further 3 m cascade, leading to (the terminal) Sump 10. It has been dived to a point 140 m in at 25 m depth. The way on from here is wide open and involves 1450 m of diving from the entrance to reach. The end of the cave is some 2 km ESE from the resurgence pool and roughly 500 m from the entrance to Langliffe Pot. However Black Keld needs to be explored considerably further before it will approach connections with the end of Langcliffe (and the end of Mossdale Caverns is even further away). Two other caves explored by divers are probably associated with Black Keld. 300 m down valley is a normally static pool at the entrance to White Keld, a south eastwards trending system containing seven sumps, characterised by very clear visibility. This is because the cave carries mainly percolation water (although it is possible that some of the water from the Mossdale and Langcliffe area formerly flowed through it). The current end of White Keld is well short of the end of Black Keld and the final section of the former trends more down valley. Nearby is Spring Trap Cave; this is a smaller cave by comparison and it includes a couple of short sumps which divide, with the best way on not being obvious. 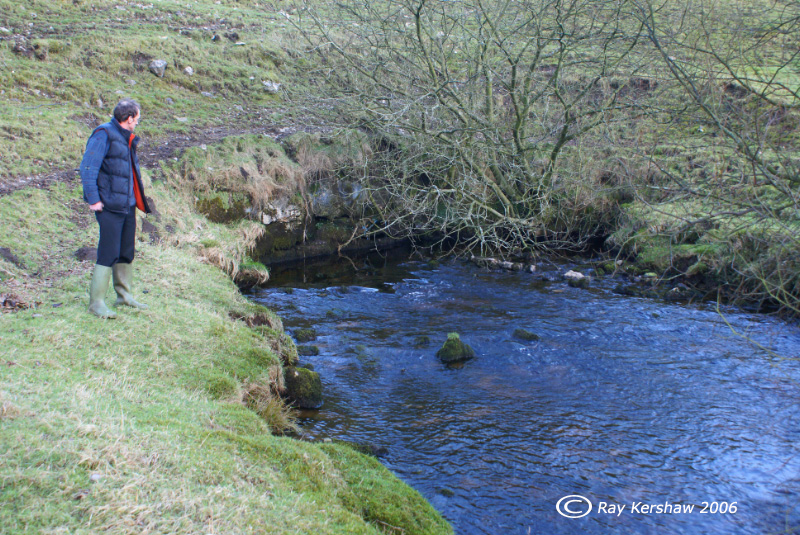 Its clear water may be fed from an outlet partway along the passages in White Keld. Much more detail is available in “Caves of Grassington Moor” (pages 27.1 – 27.14) by D.Brook and P.Murphy, which is Chapter 27 in the BCRA book: Caves & Karst of the Yorkshire Dales, Part 2 (Ed A C Waltham & D J Lowe). This chapter is already available online (details on BCA website) and the printed book is expected to appear during 2017. Another valuable source of information (which includes larger scale surveys) is the Cave Diving Group’s Northern Sump Index 2015. Please note that the access situation at each of Black Keld, White Keld and Spring Trap Cave is fragile. It is essential that anyone interested in visiting (even just on the surface) should first contact the Northern Section of the Cave Diving Group for up to date information. Failure to comply with the landowner’s wishes could easily lead to a total ban, as has been the case previously.